Star Strider is that rare thing in the FF universe - a book set on Earth. It's Earth somewhat far into the future, but Earth nonetheless.There's Madrid, 'Roma', Paris and London... but I only found this out from a map, not from experience. 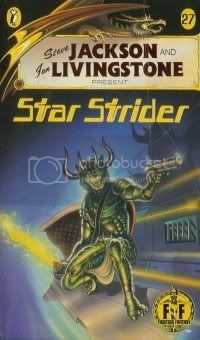 Another difficult entry, Star Strider finds you, a bounty hunter of some sort, on a mission to save the Galactic President, who's been kidnapped by the Gromulan race and hid on the backwater planet of Earth. Right off the bat Iknow this isn't going to be any normal FF book - the instructions are slightly rewritten to be more like a mission briefing - I'm even given the option to not accept the mission before the book proper even begins - but there's a flaw. Nowhere is it mentioned your scores can never exceed their initial levels. I thought this an error till in the very second paragraph I read I ate some 'food cubes' and gained a stamina point, without the chance to have lost any. The future rules! Apart from the kidnapping and all that. So once on Earth, I'm on the way to Madrid when some Gromulans realise I'm a rogue tracer ( the fancy future term for bounty hunter). Surprisingly enough, they let me go. Once in Madrid, I ignore the suspicious looking android (some are agents for us, others have turned to the dark side) instead try to capture some local houlgans/hooligans. The one I capture is just a kid, and takes me to their gang - who hate the Gromulans too. They suggest trying one of two places - the Plaza de Toros, or the hacienda - the latter of which is more lightly defended, and probably host to New Order gigs, so I choose that one. It might not be guarded by androids, but it's host to laser beams. Having watched the Mythbusters episode where they figure out how to escape detection by burglar alarms, the dice roll me lucky and I'm in. A butler robot accosts me but I deal to it quickly (by now I've got 31 stamina and am feeling quite invincible). A little comes out, and it seems I've destroyed the android she sent to get her a drink. Still, she wants to play - I suggest a game involving her family's ComTerm (like an internet access point), and she's keen. Sweet! To get in though, there's a maths problem - a 'fill in the missing number and turn to that page' problem. I worked it out in some backward-assed manner, and was faced with a much easier problem. Who blocks off their internet with maths problems, anyway?! Anyway, onto Roma, I find a member of the underworld there who apparently has some info. unfortunately, he won't even talk to me until I've won a round of Russian Roulette, which I lose. Grrr. It was a frustrating way to lose, as I was quite enjoying Star Strider. It strikes a nice balance between feeling open-ended but still with enough purpose and drive - the continually leaving bus/train/subway thing keeps you moving along, as does the time limiton your mission - 48 hours. I didn't get the impression, at least this far in, it was too random, and it felt like an intelligent romp. Perhaps a little too heavy on the backstory/info, but intriguing nonetheless. I never talk with strangers till they win a game of random suicide either. Some say it is too high a price to pay but it really cuts down on the chatter.